ABUJA— The Federal High Court, Abuja, is currently abuzz with multitude of Biafrans from far and near, who gathered to show solidarity with the leader of the Indigenous People of Biafra, Mazi Nnamdi Kanu. The court premises is heavily barricaded by armed Nigerian security agencies comprising of the Army, DSS, Police, Civil Defence and others who have continued to deny Biafrans access to the court premises. When Biafra writers' correspondence arrived the Court premises, they were barred and ransacked by these heavily armed security men before ordering him to follow another path leading to the court. 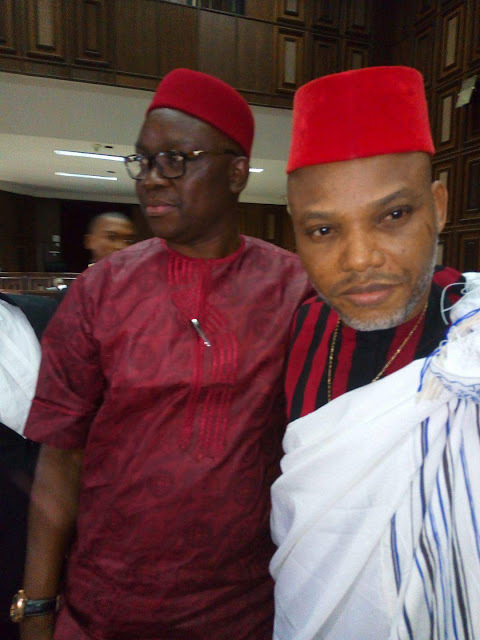 Nevertheless, the atmosphere changed when the leader of the Indigenous People of Biafra stormed the court premises in grand style, alongside the other 3 accused, BenJamin Madubugwu, David Nwawuisi and Chidiebere Onwudiwe. Shortly after the arrival of the accused, there was a loud ovation as Gov. Fayose of Ekiti stormed the Abuja federal high court in support of Nnamdi Kanu. In a chat with Kanu, he applauded his great courage and urged him to be resolute. He also assured him of his unwavering support in his case against the Buhari-led government of Nigeria. Meanwhile on the hand, Fani Kayode who came with governor Fayose was denied access to court room by the Gestapo outfit, DSS. 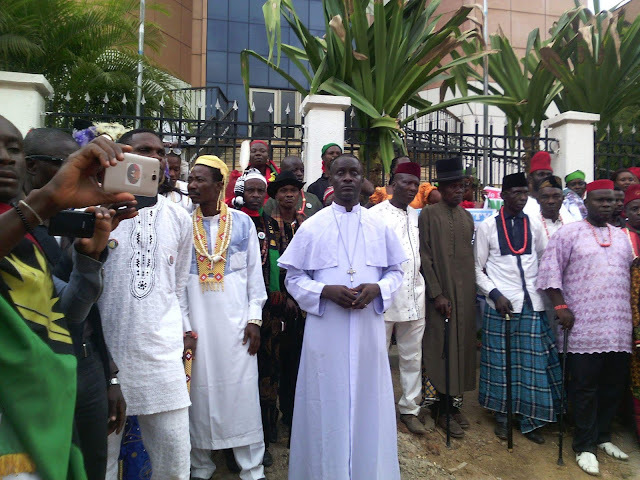 Biafrans including a catholic priest, children and traditional rulers of different ethnic groups are all gathered both inside and outside the court premises in solidarity with the leader of the Indigenous People of Biafra, Mazi Nnamdi Kanu whose trial is expected to kick off shortly. The appearance of the Ekiti State Governor in court today is a good omen, a proof that Nnamdi Kanu has bought over the hearts of many, including the Nigerian politicians of other extraction. May God bless you, Fayose. All hail Biafra. Governor Ayodele Fayose, the lion of Ekiti State and former Aviation Minister, Mr. Femi Fani-Kayode, are the only courageous political figures in Nigeria today. Biafrans love you for your uncommon courage and will stand with you against any persecution from the tyrant and dictator Buhari/APC oppressive regime. You are our brothers and w will never forget them.